It’s a conversation that happens in house church circles and between those with some experience with house churches and the house church-curious. 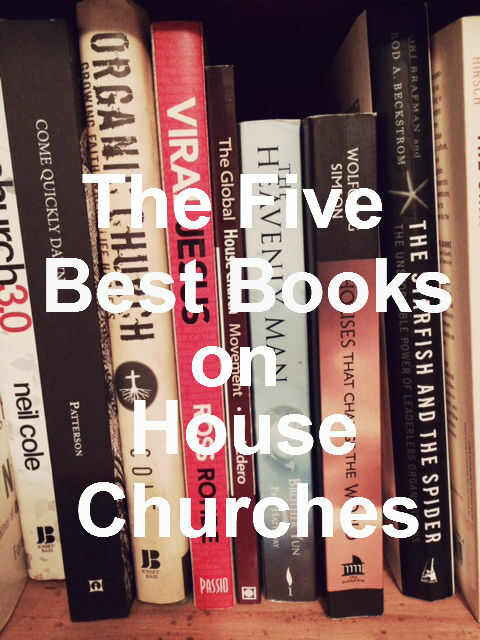 “What books on house churches would you reccommend?” The conversation then turns to what people have read and what people haven’t, the strengths of one approach over another, etc. I originally started this post just as a resource to give people a jump start on their understanding of house churches. But as I began writing about the books that have been meaningful to me, I found that the books I was recommending were different than where most people start the conversation. You’ll notice that this is a global list, three of the five authors aren’t Americans and two of the five don’t speak English as their primary language. What I love about that, is while these books are applicable to our context, they allow us to sit at the feet of others who aren’t trapped by our particular world-view. They allow us to look at church and Scripture through a different lens than we do here in America. And I think that that is helpful. This was the original house church book for me. A leader I respected in the church we were part of said “If you want to understand what God is doing in our midst, you have to read ‘Houses that Change the World. '” I picked it up. I didn’t like it. I wrestled with every idea in the book. Eventually it pinned me. It begins with Wolfgang’s 15 Theses (worth the price of the book, btw) that challenge the state of the current church and then moves to a sweeping vision of why and how we do church in homes. What I love about Houses is that it’s written by a German who saw God raise up a multiplying network of house churches in India. It’s truly a global, apostolic book that challenges “Church As We Know It.” If you check out one book on this list, this is the one I recommend. Long-time readers of the blog may recognize Viral Jesus because I reviewed this book several years ago and gave a copy of the book away. This book is an absolutely fantastic invitation into a lifestyle centered around the mission of Jesus, especially how he describes it in Luke 10. Ross shares multiple stories about planting house churches in a Western context. All of these stories have Ross or one of his friends following Luke 10 and sharing the Gospel with men and women of peace. Miracles happen, people come to Jesus, and new organic house churches are started as a result. I highly recommend this book because of its strong emphasis on the church growing through apostolic mission. This may be the book most unfamiliar to my readers, but it is a gem. Zdero crammed a ton of good theology and practice into a short space, which makes for page after page of profound insights. This book was foundational to me at a time when I was beginning to think about planting my first house church and answers questions with wisdom I haven’t seen anywhere else. The real asset of this book is its global perspective. It’s not limited by our normal western grievances with “Church As We Know It,” but really pulls the reader into an understanding of what God has done and is doing around the world. If you’re looking to plant a Kingdom house church and not just an Americanized-version of house church, this is a great book to pick up. Okay, so this one is not technically a house church book, but I included it because it captures the heart of what I believe the house church movement could and should become. It’s the story of Brother Yun, a Chinese leader in the underground house church movement. It’s basically his testimony of following Jesus, preaching the Gospel, starting churches, and enduring persecution. All of this happens in the context of churches that meet in homes and send out others to do the same. The book is simultaneously filled with miracles and heartbreak. You will be inspired by the stories of believers who have sacrificed much to follow Jesus and challenged to see your church embrace many of the realities described here. While this book was the Christian Book of the Year in 2003, many people read it as an inspiring story and not as a life to imitate. Don’t make the same mistake! You’ll probably realize that I left some notable titles off. Pagan Christianity, Reimagining Church, and The Rabbit and the Elephant are just a few. Some of these I haven’t read and others are good books, but much of their content will be found in these books as well. No matter what our jumping on point is, moving towards a more organic, missional, apostolic form of church that results in Christ-formed followers is the goal. Now, what about you? Which books have been helpful in your journey towards an organic, missional, apostolic church? Note: The links to these books are part of my Amazon Store. While my opinions are mine and offered freely, I do stand to benefit from the purchase of these books through these links. Thanks for this list, Travis. Of those listed I’ve only read “The Heavenly Man” and I agree with your putting it on this list. (Bro. Yun is actually coming to our area in a little over a week…can’t wait.) Thanks for the other recommendations as well.